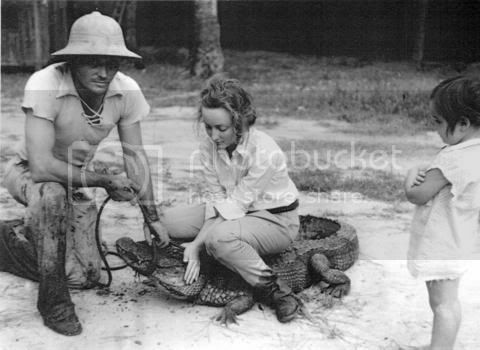 This is a photograph of my grandmother on an alligator hunting expedition on Caddo Lake in East Texas. The man in the pith helmet captured wild creatures for circuses, which is where this poor creature was headed, and somehow my grandmother and some of her friends got to tag along on the trip. Note that the little girl in the picture, the circus man’s daughter I believe, is wearing a flour sack with armholes cut into it. This hunting trip was actually my grandmother and grandfather’s first date. They had just met, but my grandfather had such a good time that he decided that my grandmother was the woman for him and proposed shortly afterwards. I have a friend whose mother rode elephants in the circus at Blackpool Tower. She, like your grandmother, was an attraction in her own right, no doubt. Not only does it rock to have a grandmother who has sat upon a gator (and looked so beautiful while doing it), I am LOVING the laced-up front of that dude's shirt. Loving it. Yowza! What a beauty she was. Wow! Grandma was a hottie! I see a big resemblance to Rae. The little girl is probably wearing a feedsack dress. I have a quilt my great-grandmother made out of feedsacks.